TORONTO, June 28, 2018 /CNW/ - With the date of legalization set for October, Business of Cannabis and MNP today launched Meet the Industry, a rich media content series featuring interviews with the key leaders defining and shaping the emerging and fast-growing Canadian cannabis industry. 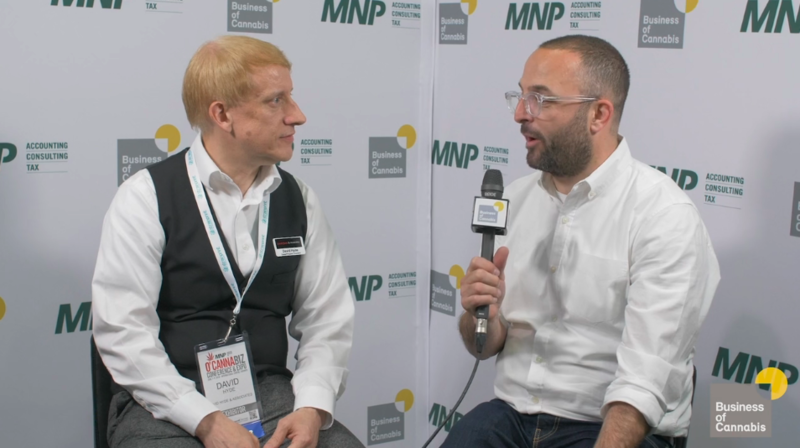 Jay Rosenthal of Business of Cannabis interviews David Hyde of David Hyde & Associates for "Meet the Industry" presented by MNP. "The Canadian cannabis industry is comprised of some of the most entrepreneurial and forward-thinking business leaders in the country," said Glenn Fraser, MNP's National Leader for Cannabis. "This partnership with Business of Cannabis helps tell these inspiring stories." The series launched with 21 interviews conducted on-site at the O'Cannabiz Conference in early June. Guests include: David Hyde, Owner, David Hyde & Associates, Derek Riedle, CEO & Publisher, Civilized, John Fowler, CEO, The Supreme Cannabis Company and Stephanie Karasick, Founder, Strainprint Technologies. "Our goal has always been to feature the innovators, thinkers and leaders in the Canadian cannabis sector," said Jay Rosenthal, Co-Founder and President, Business of Cannabis. "Meet the Industry is a great platform from which to do this." To view the Meet the Industry series, visit businessofcannabis.ca.